Ice Cream Dreams is a family run business. 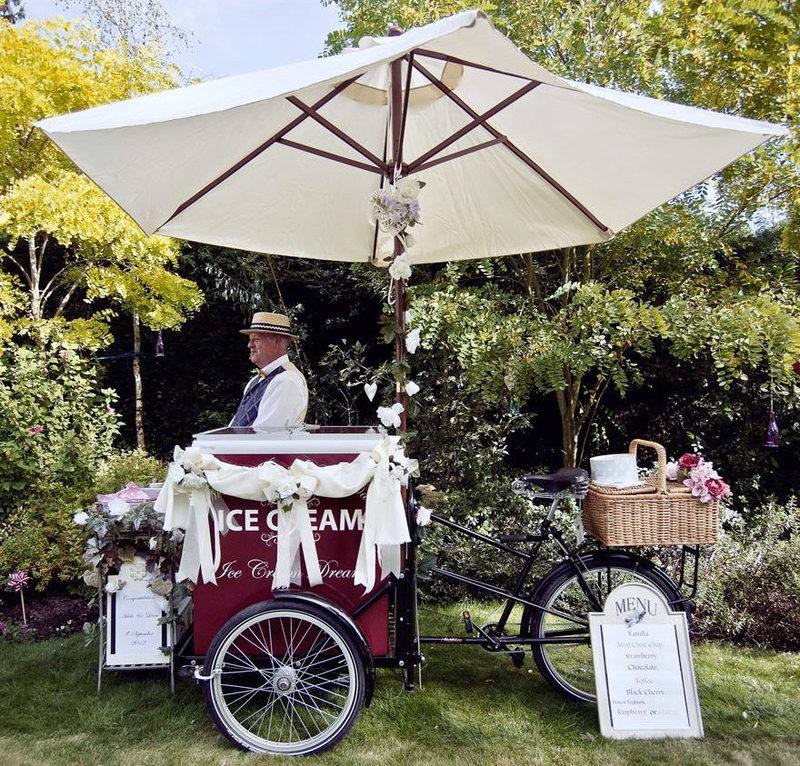 Using our ice cream bicycles we cater for Weddings, Civil Partnerships, Corporate events, Country shows, Parties, Galas, and Fairs. It is owned and operated by Debbie Tilsley who is ably assisted by husband Steve. Ten years ago the idea was simply to have a bit of fun with the ice cream bike. It went down so well that Steve had to buy another three to keep up with the demand. Providing a perfect photo opportunity, these ice cream bicycles always raise a smile. Debbie and Steve first met on the miner’s strike in 1984. Steve was a policeman with the Cambridgeshire Force. He met Debbie, a local girl from a small mining village, in the only pub that the police were welcome. Married for 31 years they have four children. Debbie worked in the caring profession for many years. More recently she has concentrated on voluntary work in the community. When Debbie was a girl she helped her dad working on an Ice Cream van in Chesterfield. Once set up on a pitch he left her to it whilst he worked elsewhere. ‘I often had threats by rival Ice Cream vans if they thought we were in their area. I never thought that I would one day be serving Ice Cream again and actually enjoying it’. Now retired from the Force after 36 years and after stints as both a Cambridge Chauffeur and as a Security Manager, he is now concentrating on expanding the ice cream bicycles business. ‘Certainly, the older you get….the wiser you get but I also believe that the older you get…. the dafter you get and that’s just the way it should be’ !! 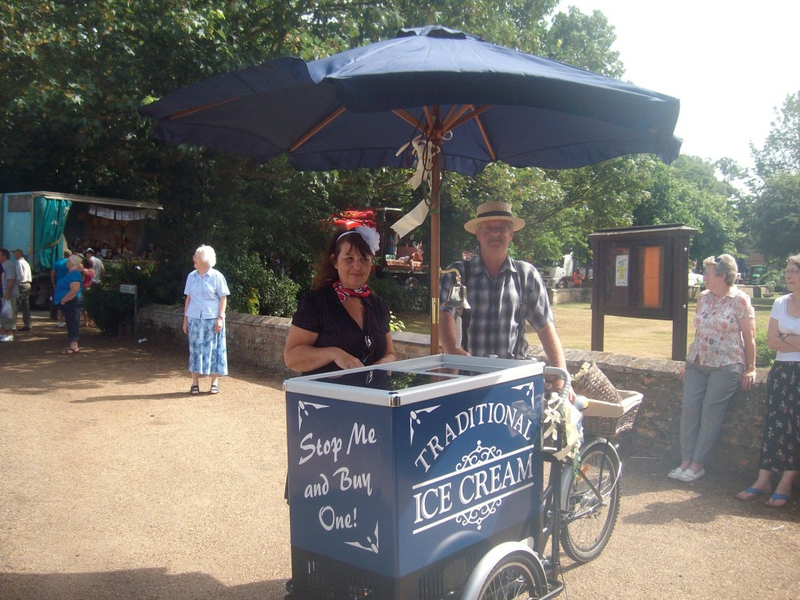 We serve only the finest Dairy Ice Cream from our ice cream bicycles. It is handmade at the award-winning Dennetts of Spilsby. LUSH!! 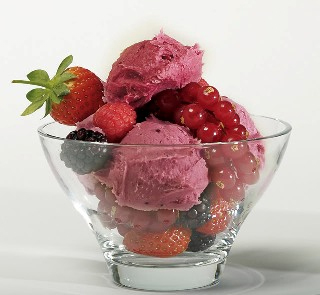 We also offer the alternatives of Frozen Yoghurt or delicious Sorbet in a variety of mouth-watering flavours. So if you would like to have the bike at any event or function you have planned please contact us for an informal no obligation chat or send us an e-mail via the contact us page. We will always strive to make your event even more special. So if you like delicious Ice Cream just give us a ring today and we will do everything we can to help.